I arrived the day before the conference and decided to eat dinner close to my hotel since I was tired after traveling from coast to coast. 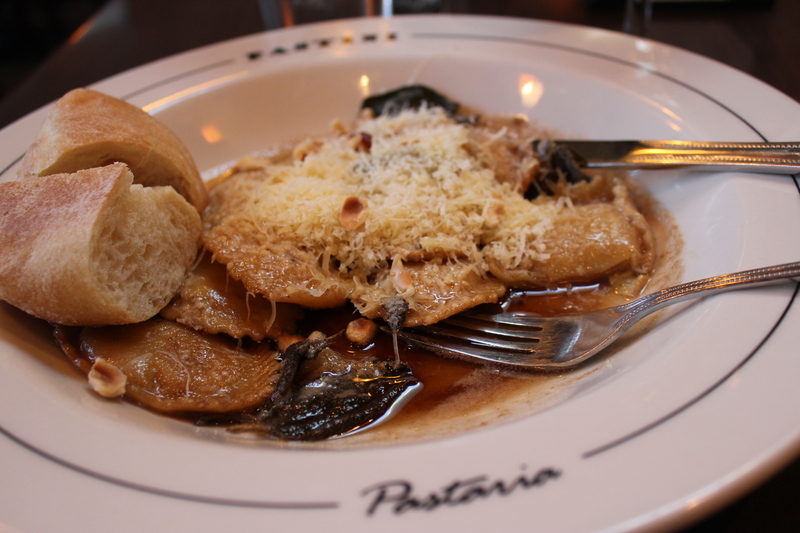 I wound up at Pastini Pastaria (1426 NE Broadway, Portland, Ore., 97232.) I had the butternut squash-gorgonzola ravioli, which was recommended by my excellent server Mariana. It came with sage brown butter sauce and toasted hazelnuts ($11.95) and was the comfort food I needed after a long day on planes. The pasta was tender, hazelnuts plentiful and the cheese was fresh and lots of it. Perfect meal to end the day. I had some time in the morning the first day of the conference and decided to take the train downtown, walk around and find a place for brunch or early lunch. 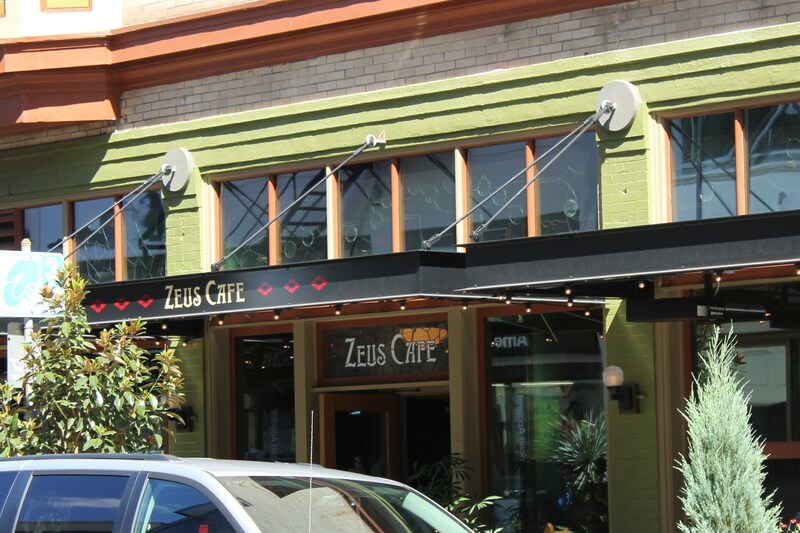 I wound up at Zeus Café (303 SW 12th Ave., Portland, Ore., 97209) and consulted Yelp on my iPhone, with hopes that the reviews would be positive – this looked like a cool place and it served brunch. The comments were good enough for me to try it and I’m glad I did. 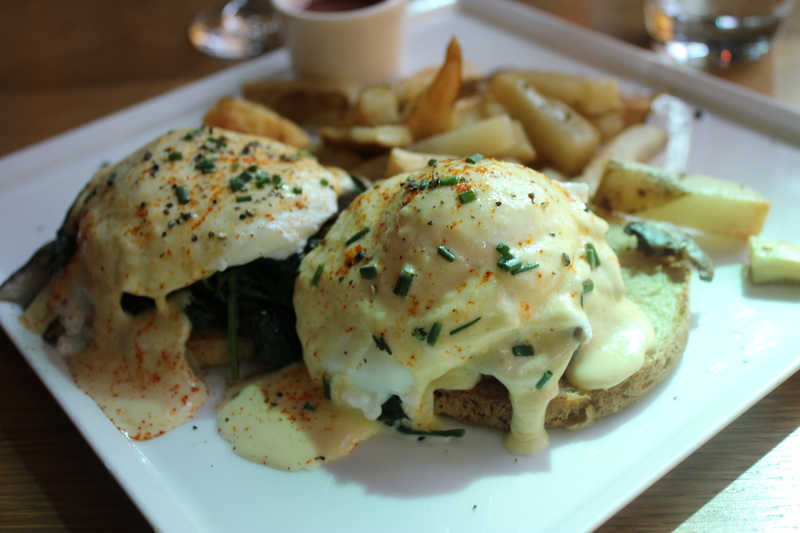 I had Eggs Benedict Florentine with home fries and a wonderful mimosa, with fresh squeezed orange juice – yum. I loved the ingredients and presentation of the dish – it included tomato slices, mushrooms and fresh spinach on top of fresh-baked crumpets, topped with poached eggs and hollandaise sauce. Very nice, but it needed salt and I wished the eggs had been a tad more runny. Fries were quite tasty. I had a great table next to one of the huge windows that overlooks the street, which was nice. The service was friendly. Opening remarks – This was a fantastic session with Bruce Seidel, CEO of YouTube’s Food Channel “Hungry.” Mr. Seidel was previously with the Food Network for years and helped develop shows such as Iron Chef America. 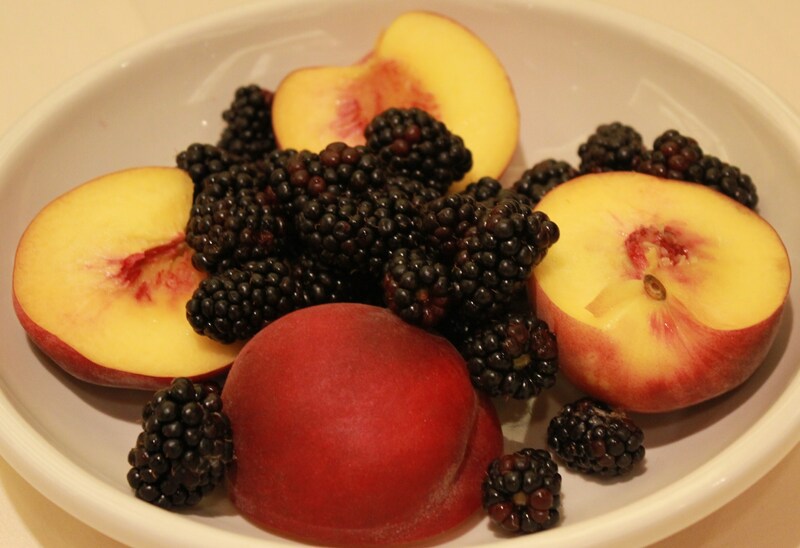 He gave a fascinating talk with snippets of the not-so-distant digitalized food world. The Food blogging/texting/tweeting session rocked! 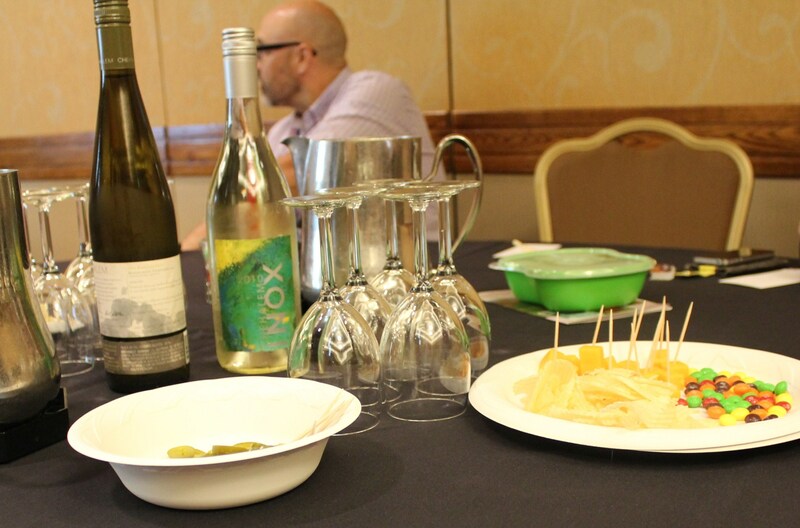 Each table sampled 10 Oregon food and beverage products (from a possible 22 vendors) and we had five minutes to taste and tweet/blog about what was presented. It was fun, fast, furious and tasty! 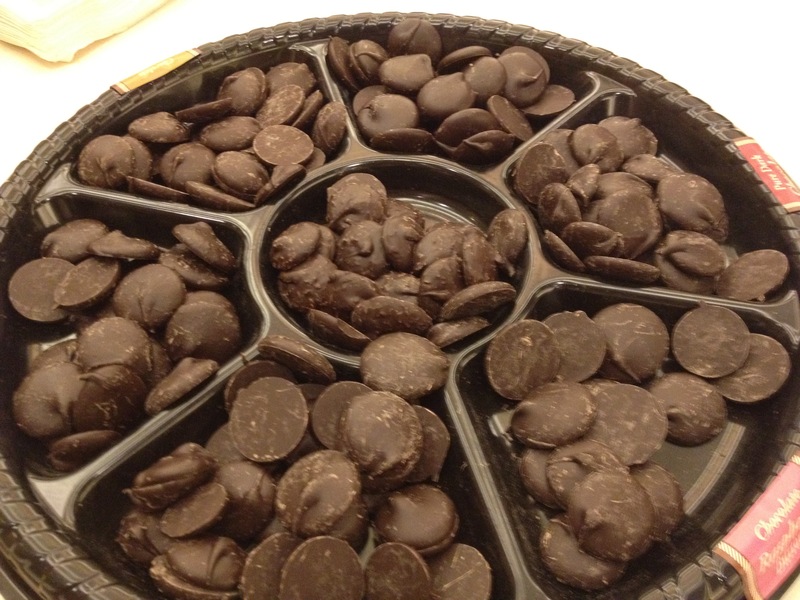 Some of my favorites included the vegan chocolates by Chocolate Decadence, wild-caught Albacore tuna from Culinary Center in Lincoln, sourdough bread by Rockfish Bakery Café, and Silverspot IPA from the Pelican Pub & Brewery. Everything I tried was great! 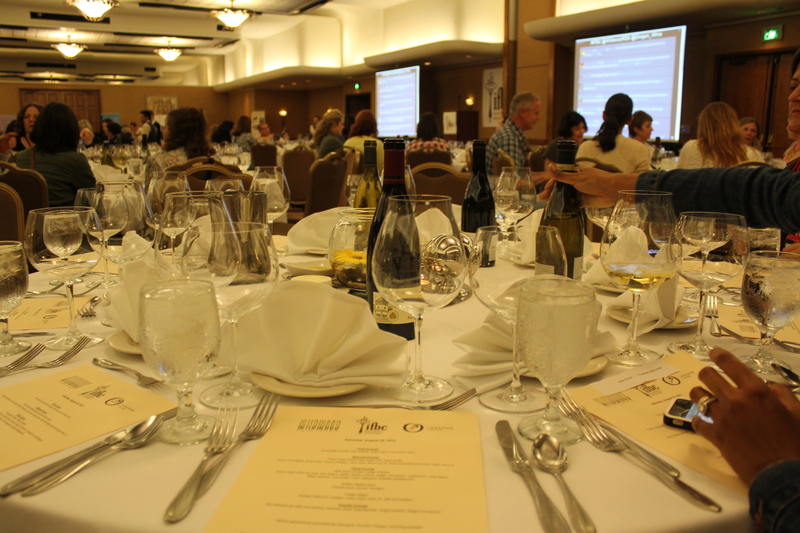 Later I attended the Food and Wine Reception hosted by Oregon’s Washington County. 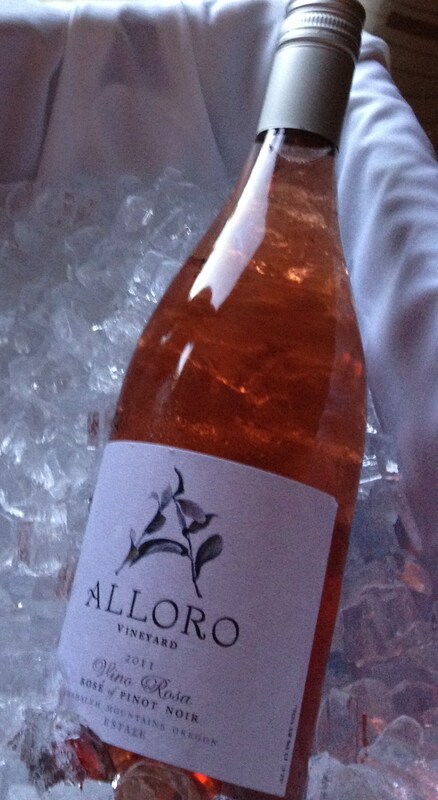 This was quite nice and I sampled a number of Oregon wines, especially some great roses and pinot noirs. 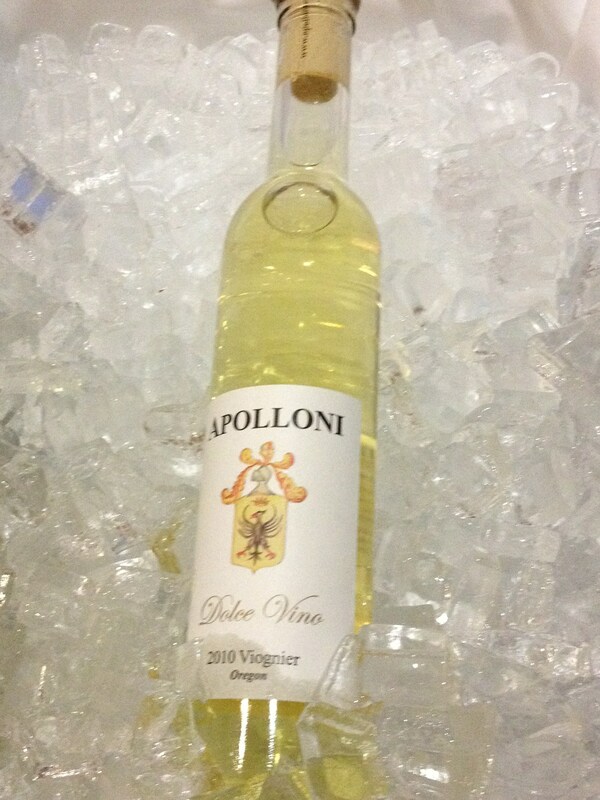 However, I think my favorite was a 2010 Apolloni Viognier, a delightful dessert wine with apricot, pear and spice flavors. I rarely drink dessert wines, so maybe that’s why this one stood out for me. 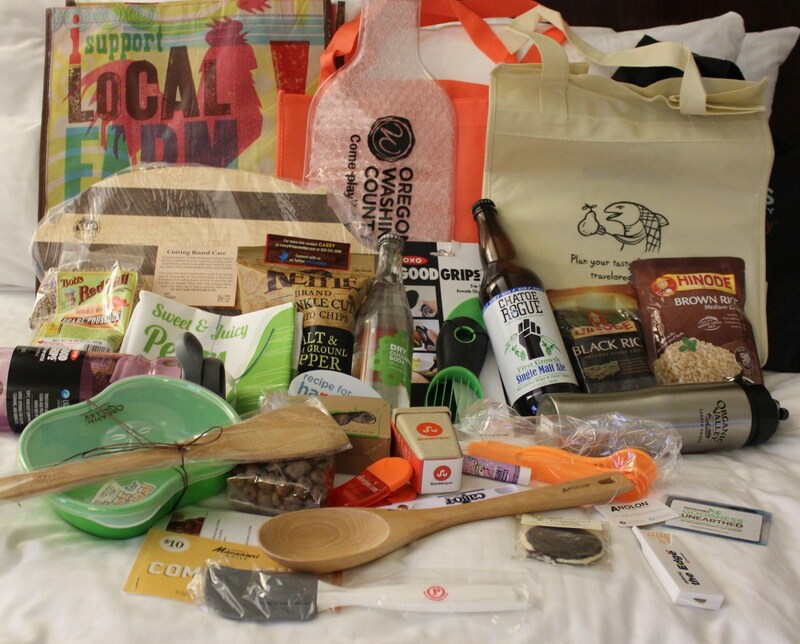 A Taste of Oregon and Gourmet Fair ended the evening – talk about swag! I took a lot of it, wondering how I’d get it home. I didn’t check luggage for the 5-day across-country trip, so the two bags I carried on were already heavy, especially with a laptop in tow. However, I solved the problem by shipping most of it home, thanks to fellow blogger Jennie Chen of MisoHungryNow.com, who had an empty box and packing tape. Foodwise, I think my favorites were the fresh gazpacho with shrimp from Urban Farmer and some fantastic Kampanchi Nigri from Departure. 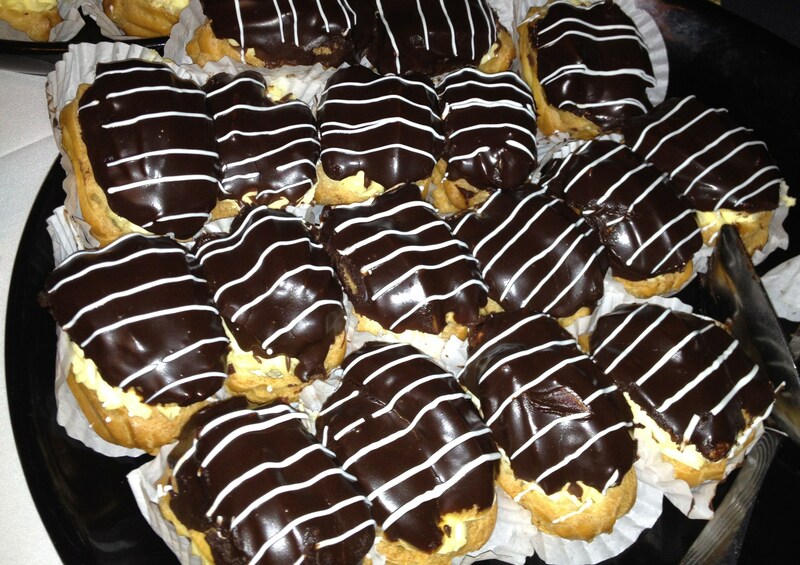 Oh, oh, oh – so good! There were so many informative sessions on Saturday that I’m not going talk about here, but I hope I’ll be able to apply some of what I learned to make my blog more attractive and appealing. 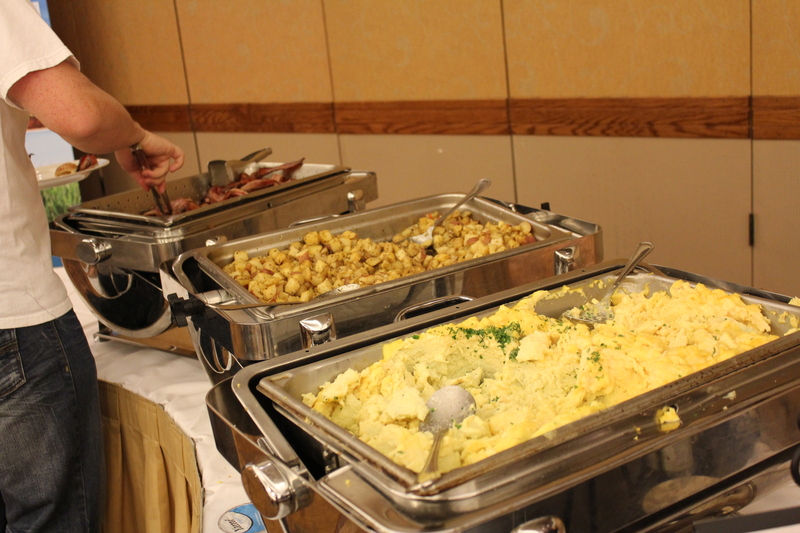 Breakfast was sponsored by the National Pork Board, with lots of fresh fruit, eggs, breads, cereals and of course, bacon. Nice way to start the day! Lunch was sponsored by Ninja and all attendees will be receiving its latest product, the Ninja Cooking System, which “makes complete homemade meals easier, healthier and more delicious.” This essentially is a slow cooker on steroids and will be retailing for around $190.00 or so. This looks like a great combination of a crockpot/foodsteamer/etc., and I can’t wait try it out! Ninja provided a good lunch and I especially liked the pear and apple salad with the bleu cheese. 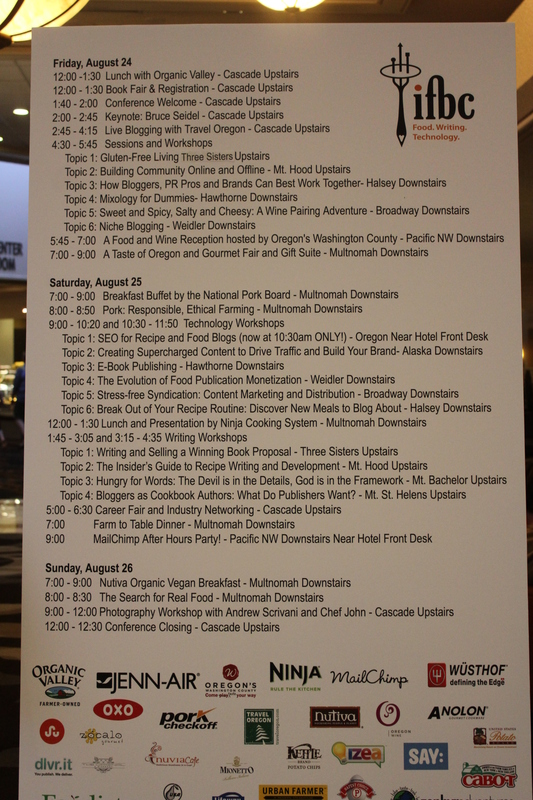 Before dinner there was a great networking session with various PR firms, publishing companies, food websites, etc. I actually won a Kindle Fire from Allrecipes.com – how cool is that! I’ve used Allrecipes.com for years, long before I started this blog, and have made many a tasty meal from some of the recipes I’ve found on its site. 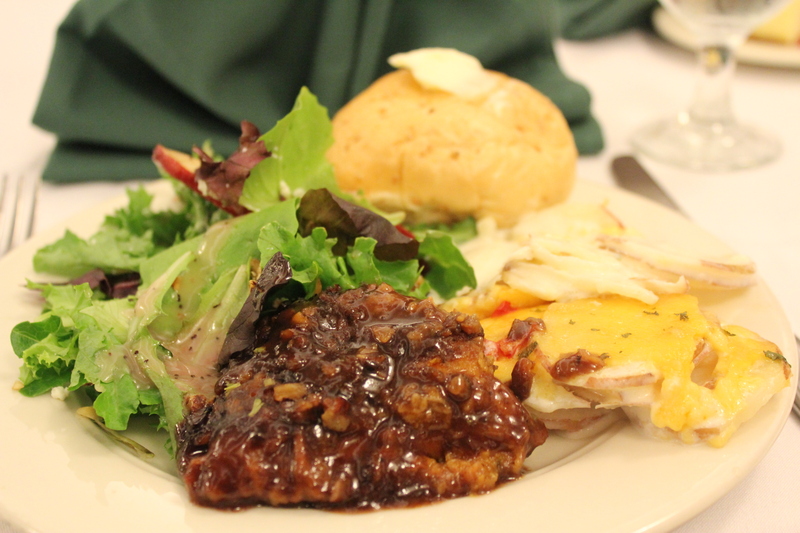 The Farm to Table dinner was provided by one of Portland’s best restaurants – Wildwood Restaurant and Bar. Local wines were provided by Oregon Wine and paired with the meal quite well. 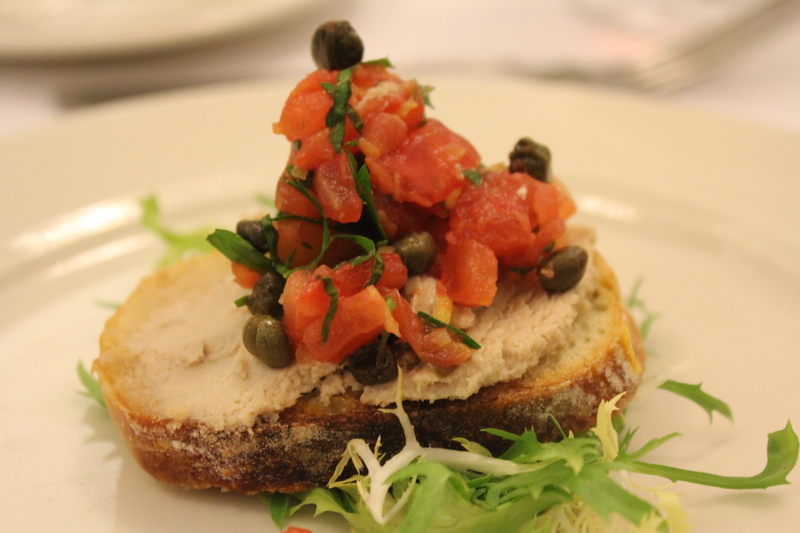 The first course was tuna pate crostini with tomato, fried capers and lemon zest. What an explosion of flavors – the saltiness of the capers, creaminess of the pate and tartness of the lemon made this one of my favorite foods of the evening. 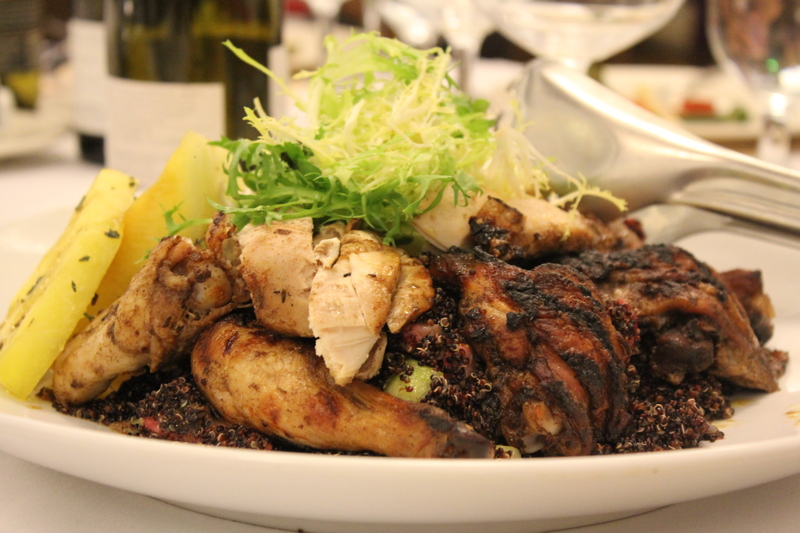 The main course was jerk spice Draper Valley chicken over black quinoa with roasted strawberries, with grilled watermelon and Frisée salad, served family style. I will definitely visit Wildwood Restaurant and Bar and executive chef Dustin Clark on my next visit to Portland. Wines were great as well and were generously provided by Domaine Drouhin Oregon and King Estate. There was an after party hosted by MailChimp, which was a great way to mingle and network. I learned more about some of the bloggers I met on the first day of the conference and met some new ones as well – fun times! The conference ended with an awesome 3-hour session of food photography by Andrew Scrivani of the New York Times and live cooking with Chef John from Food Wishes. It was informative, lively and completely hysterical at times. There were numerous tweets on how they should have their own television show – I know I’d watch! We spent the last 30 minutes practicing our photography with tips and advice from Andrew. I experiemented with getting up close and personal with the food. I wasn’t flying back to Raleigh until Monday, so I went back downtown in search of the food trucks for lunch. While some aren’t open on Sunday, luckily many are. 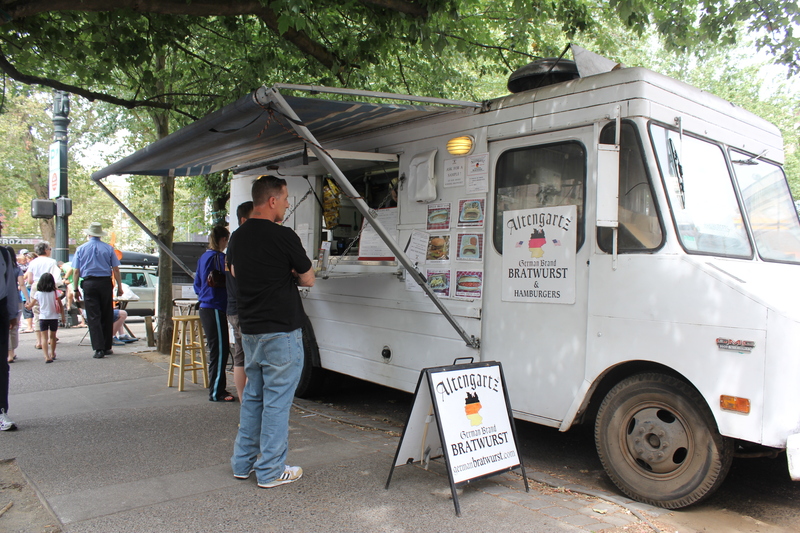 I finally decided to eat at Altengartz (SW 10th and Alder in downtown Portland) with its German Brand Bratwurst. I got the brat platter with tangy potato salad and a great four-bean salad. 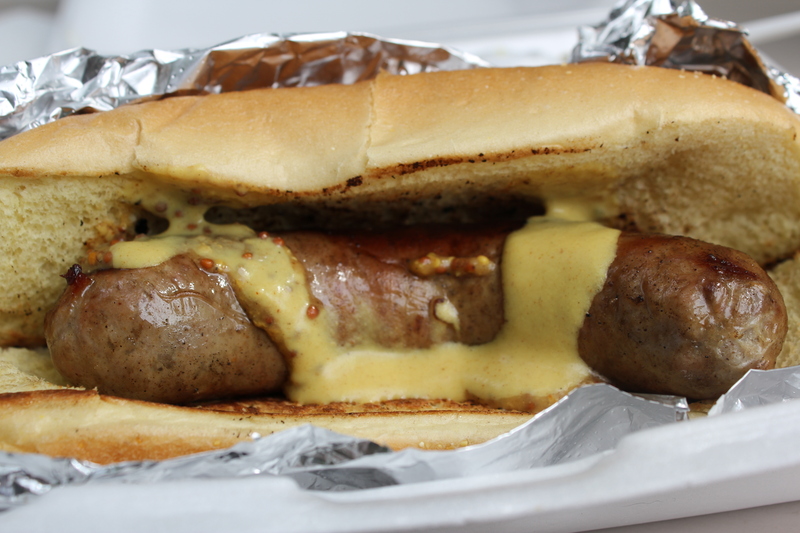 Perfection on a bun – the brat was spot-on, truly a gourmet sausage with delicately balanced spices. 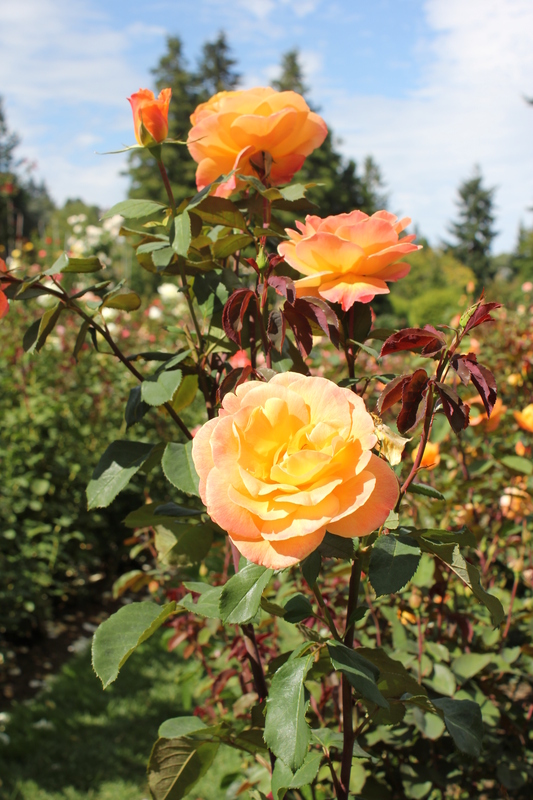 After lunch I decided to spend the rest of my afternoon at Portland’s Japanese Garden and the International Rose Test Garden – what a visual treat. 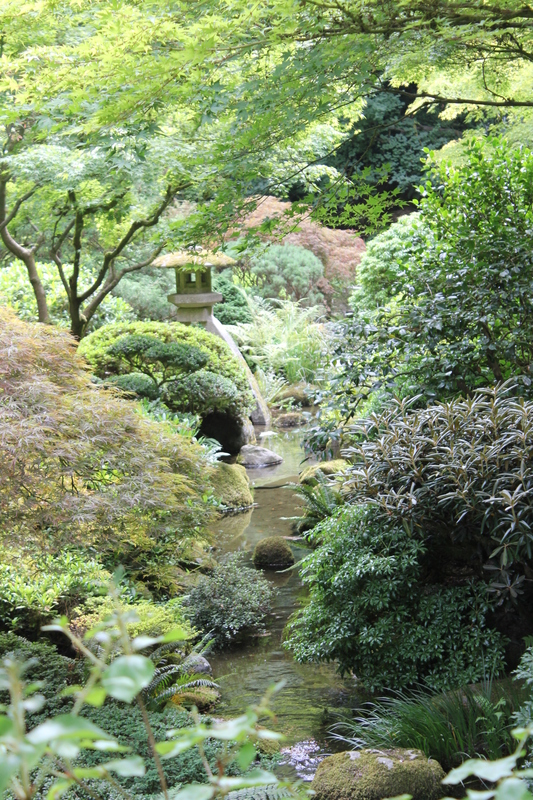 Portland’s Japanese Gardens are serene, peaceful and a true soul pleaser. 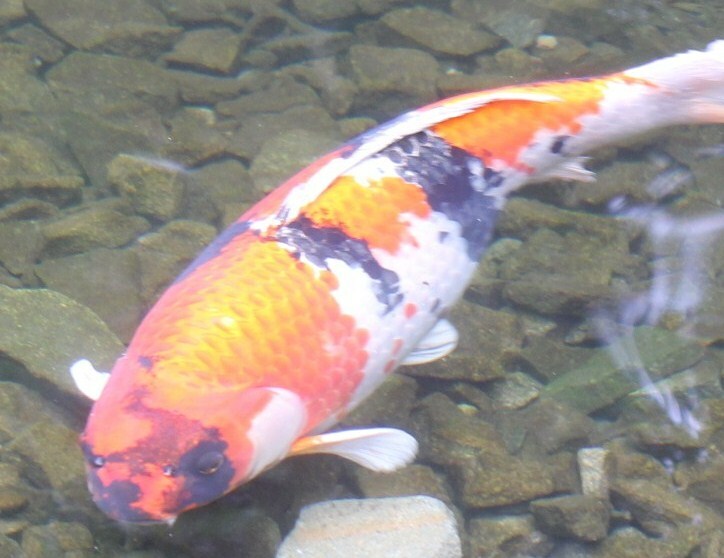 I especially loved all of the water features with the koi and waterfalls. 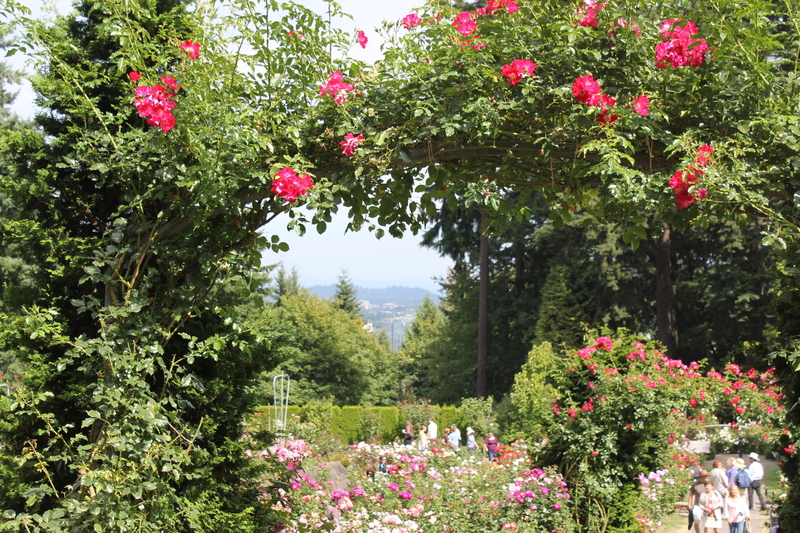 Across the parking lot is the entrance to the rose gardens with its 10,000+ roses. This place was absolutely stunning and smelled wonderful. The sun was finally coming out, and it was eye candy with the beautiful blue skies and the multitude of brilliant, vivid and dazzling roses in an assortment of colors. This is a must stop for anyone who visits Portland when these beauties are in bloom. It was marvelous to be surrounded by such splendor up close and have glimpses of urban Portland in the far distance – too cool! 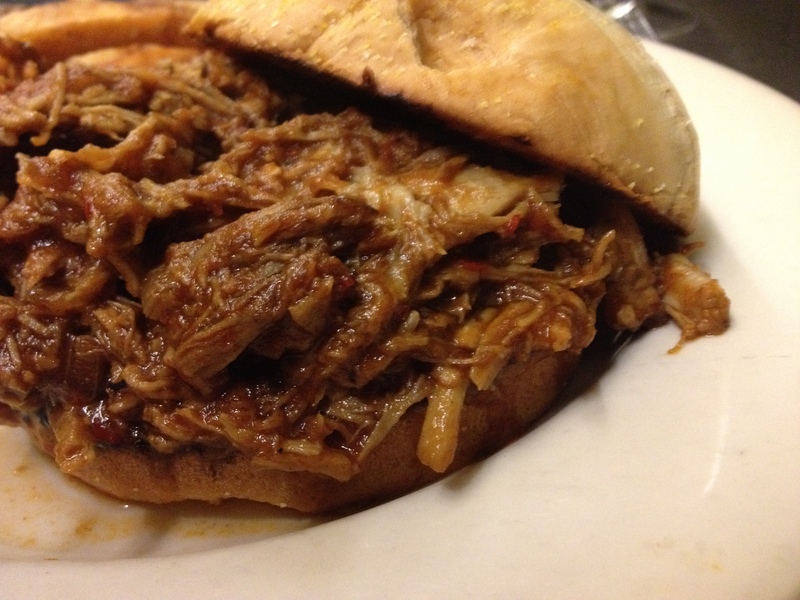 I had dinner at Milo’s City Cafe (1325 NE Broadway St., Portland, Ore 97232) and decided to order the BBQ sandwich to compare it to North Carolina’s version. It was like western-style BBQ from N.C., with a tomato-based sauce with just the right amount of sweetness, vinegar and spice. It was not as smoky as our BBQ tends to be, but at least the pork was tender and overall it was pretty damn good! What a great conference in a fabulous city! I wish I had made more time to explore Portland and plan to return soon. Next year’s IFBC is in another one of my favorite cities – Seattle. I hope I can attend! This entry was posted in My Favs and tagged Allrecipes.com #IFBC, Altengartz Food Truck Portland OR, Andrew Scrivani IFBC, Chef John Food Wishes, Foodista, IFBC Portland Oregon 2012, International Food Bloggers Conference, International Rose Test Garden Portland OR, Japanese Garden Portland OR, kel's cafe of all things food, Milo's City Cafe Portland OR, Ninja #IFBC, Pastina Pastaria Portland OR, Wildwood Restaurant Portland OR, Zephyr Adventures, Zeus Cafe Protland OR. Bookmark the permalink. Hey, thanks so much for linking to me! Wasn’t it the most fabulous conference?